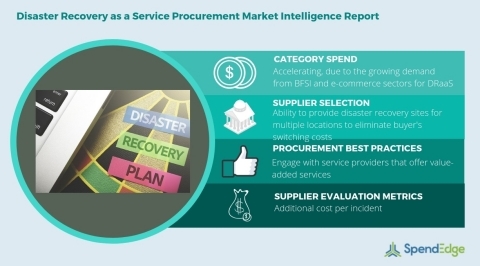 LONDON--(BUSINESS WIRE)-- SpendEdge, a global procurement market intelligence firm, has announced the release of their Global Disaster Recovery as a Service Category - Procurement Market Intelligence Report. Stringent data recovery regulations are compelling buyers from the BFSI and healthcare sectors to enable disaster recovery as a service (DRaaS) in their system infrastructure. This will prevent the loss of sensitive data during instances of cyber-attacks and hardware failures. The exponential growth of the BFSI sector is motivating enterprises to leverage advanced technologies for better storage and analysis of the enormous amount of customer data. However, such technologies make the sector more exposed to cyber-attacks leading to data loss. This is creating a pressing need for buyers to increase their spend on disaster recovery as a service category. Request a Free Sample of this disaster recovery as a service market intelligence report here! Increasing instances of cyber-attacks on the SMBs in the US have resulted in significant revenue loss and termination of operations. To tackle such potential threats in the future, SMBs are investing in disaster recovery solutions to protect their overall business data by creating complete and reliable backup systems. In 2018, North America accounted for 37.96% of the global category share which is the result of the rise in the adoption of cloud-based disaster recovery solutions in the region. In terms of spend, APAC will witness rapid growth over the next five years owing to the increasing demand from BFSI, e-commerce, and healthcare sectors for reliable disaster recovery solutions. Insights offered in this disaster recovery as a service procurement research report include supply market forecasts, major cost drivers, and category management insights. Such insights are relevant for both the buyers and the suppliers who seek a risk-free and a cost-effective procurement strategy. The category spend segmentation done in this disaster recovery as a service market intelligence report will guide the investors in identifying the best investment areas as well as help them in identifying cost-saving opportunities in the market. Get free customization of this disaster recovery as a service market intelligence report to get information tailored to your every requirement. “Buyers must select suppliers that have a wide geographic presence so that they can provide disaster recovery sites for multiple locations to eliminate their switching costs,” says SpendEdge procurement expert Tridib Bora. “By engaging with such service providers, buyers can mitigate the risk of losing data from a specific region,” added Tridib. Purchase the full disaster recovery as a service market intelligence report here! SpendEdge’s procurement market intelligence reports for the information technology category provide detailed supply market forecasts and cost drivers that impact category growth. Such information will help procurement managers as well as the suppliers to determine the total cost of ownership and change their procurement strategies accordingly. Additionally, SpendEdge’s reports provide category management insights and information on the procurement best practices for the category. Do you purchase multiple reports in a year? Our subscription platform, SpendEdge Insights, provides ready-to-use procurement research reports for various categories. Now access latest supplier news, innovation landscape, markets insights, supplier tracking, and much more at the click of a button. Start your 7-day FREE trial now.